Nancy has been at Johnson Physical Therapy & Rehab for over 2 years. 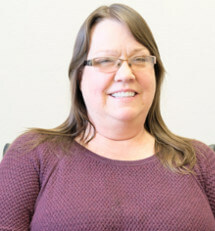 Prior to working with us, Nancy worked for over 25 years in Oklahoma City in the grocery store transportation industry. This experience has made her an important member of our team. She offers incredible organizational skills, customer service skills and is an amazing multi-tasker for the front office. Nancy is often the first friendly face a patient sees when they come into the clinic. We are so lucky to have her on our team! When she is not working, Nancy enjoys the Colorado outdoors with her husband and dog, spending time camping, hiking, gardening and hanging with her chickens.